This post is about urinary track infections. Be warned, I explain everything! I caught a UTI somehow, right after B and I were married. I did have food poisoning before this, and it is said that salmonella can cause a secondary infection, usually a UTI. After my honeymoon I noticed I was peeing blood. This freaked me out (I thought my kidneys were failing) so I immediately went to the doctor and they gave me a 3 day dose of antibiotics for a UTI. This stopped the blood, but I was still having frequency problems (when you have a UTI you have to go. All. The. Time) and pain when urinating (it hurts)! So two weeks later I went BACK to the doctor (this was at a walk in clinic) because I was still experiencing these discomforts. After having me pee in a cup, the doctor told me that I probably had a STD, but it didn't look like I had a UTI anymore. What? So since I couldn't go to the Gyno right now, B went to get tested. He was clean. Two more weeks after B was experimented on, I mean, tested, my insurance stuff finally came in and I went to my gynecologist for STD examination. They told me I didn't have any STDs (duh) but I still had a UTI. Wonder why that other doctor didn't see it? Did he even do a test? Trust me, the story only gets worse. My gyno gave me a 5 day antibiotic treatment. I took it. My symptoms went away. I was sleeping so much better (didn't have to wake up to pee in the middle of the night, huzzah!) and no more pain or frequency issues. But then...like clockwork, two weeks later my UTI came right back. I checked into natural remedies. The internet said take cranberry pills. So I started taking cranberry pills. These did nothing but lessen my symptoms for a day or so. So, like a smart person I decided that I won't go back to that first doctor that didn't believe me. I made another appointment with my Gyno. They tested me for a UTI there and said it was negative. I probably had a STD, they said. Had I had any new partners since I last came in? What? No! I replied. I'm married. They basically told me I was making the whole thing up. The pain, everything. I explained that last time my other doctor had told me I didn't have a UTI but it turned out I did when I came here. They rolled their eyes and acted like I was stupid, but they said they would send my sample to a lab for more detailed examination. I cried on the way home. Was I wrong? Am I being stupid? I thought. But no. Something was wrong. Those next few days were really hard. It felt like my bladder was attacking me. About four days later my Gyno called. Lo and behold I still had a UTI. She actually apologized and told me if I had any more trouble to come back immediately, and she phoned in a 7 day antibiotic prescription for me at my local CVS. I took it. And guess what. Yup. Two weeks later my UTI came right back. I remember sitting in bed with B and crying because it felt so hopeless. I didn't go back to the doctor right away. I was annoyed that they hadn't believed me and I wanted to take things into my own hands. I'd caught the UTI at the end of November and it was almost March! 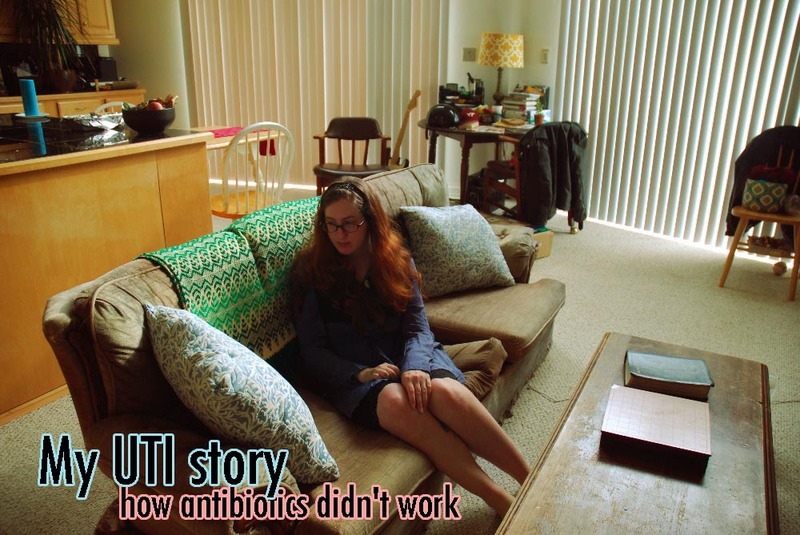 The antibiotic clearly wasn't helping. I researched and researched EVERYWHERE on the internet and found a "herb" called D-Mannose was supposed to be really good for UTI prevention. What the heck--I'll try it! Can't hurt, right? So I stared taking this D-Mannose and also a whole food vitamin. I prayed and begged God to cure me. I took D-Mannose for two days. My symptoms went away. They have never returned to this day! To say I'm relieved is an understatement. Moral of the story? Doctors are smart, but they are not God. And they can be wrong. Also, I really hate being told that someone else knows my body better then me. Did the D-Mannose cure my UTI? Who knows? Maybe my body fought it off. Maybe the vitamin pills helped. I'm just glad its gone and I hope it never comes back.